Welcome to the Swan Crest Virtual Trek! 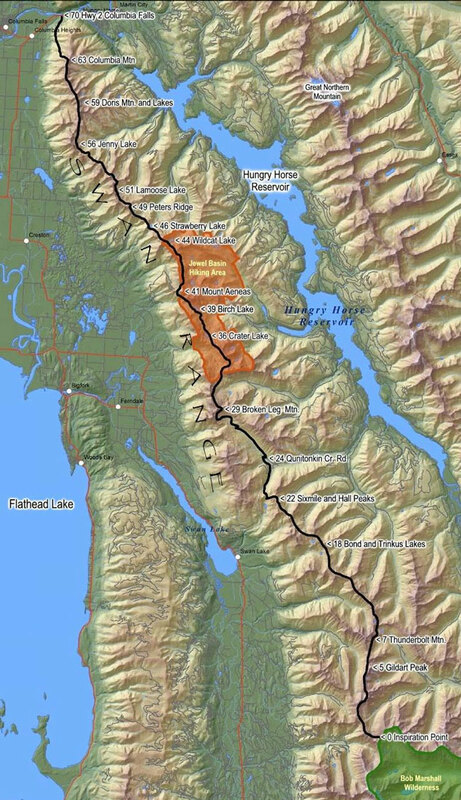 The 70-mile Virtual Trek runs along the spine of the Swan Range from the Bob Marshall Wilderness at Inspiration Point to U.S. Highway 2 near Columbia Falls. The Virtual Trek consists of an interactive map (below) showing the route, primarily along Historic Alpine Trail #7, and a chart on which you can track your progress. Periodic mileposts offer the visual rewards of the Swan Range, starting at Inspiration Point at the south end of the map (also available as a non-interactive but printable pdf). Along the way, click on the Trek Milepost names and other highlighted features to see photos and learn something of the history, geology and wildlife of the Swan Crest. We hope the Swan Crest Virtual Trek raises appreciation of our local, backyard wilderness — the Swan Range — and strengthens the connection between exercise, health, and the Great Outdoors. Most of all, we hope it makes you want to step away from your computer and experience the Swan Crest firsthand. The best of luck and good health! Let's start hiking! Important note: The Virtual Trek map is not intended to provide the detail you need for an “on the ground” hike or ski of the Swan Crest. For proper maps and details, stop at a Forest Service office or sports store like Rocky Mountain Outfitter.